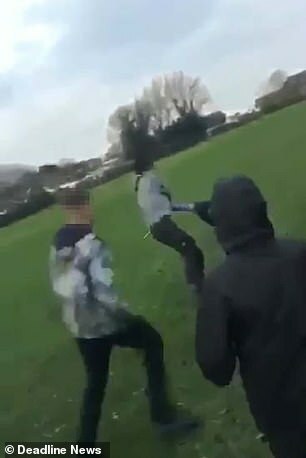 Horrifying footage shows the moment a boy is beaten with an iron bar and a bike saddle by a gang of youngsters, the latest depressing episode in Wild West Britain. 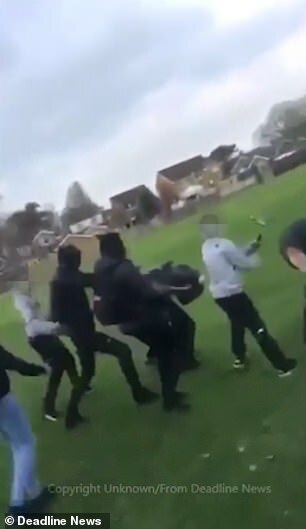 The video, believed to have been taken in Longton Park in Preston, Lancashire, shows a crowd surrounding a boy before one launches a vicious attack on him with a metal pole. Then at least four others pile in and throw kicks and punches at him as he tries desperately to escape. In one chilling moment, a thug stamps on the boy’s head. The brutal assault comes just days after a young Syrian refugee was beaten and humiliated in a playground attack that shocked the nation. While in another all too familiar chapter, an army of violent teens in Durham were filmed launching fireworks and missiles at police in an attack described as ‘appalling’. 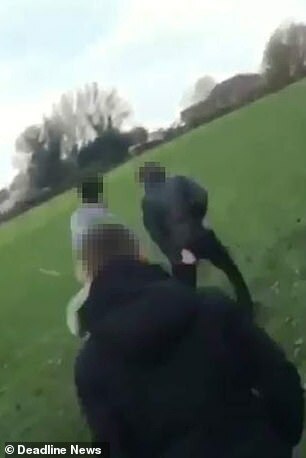 The footage of the boy in Preston appears to have been filmed by one of the gang which was then circulated on the social media platform Snapchat. was posted by a resident, Stacy Dawn-Anne Stevenson-Brook, in an attempt to try and find the culprits responsible. The clip begins with a group of at least six boys following another boy who is wearing a black jacket. 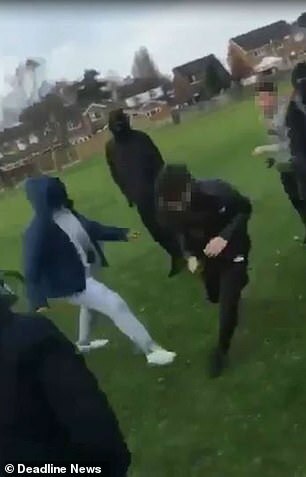 One boy, who is wearing a grey jumper can be heard saying; ‘Why did you do that do me, fam, why did you do that?’ before suddenly taking an iron bar from his trousers and starts attacking him with it. Soon after this six other boys quickly join in, including one who appears to have a bike saddle as a weapon. In a desperate attempt to flee, the boy runs away from the group, but two others stop him and also start attacking him. He then eventually manages to escape them before the video ends. Miss Stevenson-Brook posted the video, which was taken last Saturday afternoon, to try and raise awareness on the issue. She said: ‘The following video is very uncomfortable viewing. I struggled to watch it, and it’s not my child being attacked. ‘It is my understanding that most of the kids in this area have seen this video, hence how I came to see it. I wonder how many parents have watched it? ‘Please share this video, not only to raise awareness of how dangerous this can be and how much worse the outcome could of been. South Ribble Police released a statement on their Facebook page confirming one boy had already been arrested. 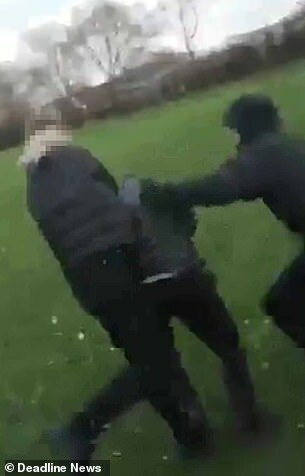 It said: ‘We’re aware of some mobile phone footage circulating on Facebook which appears to show a number of boys fighting and assaulting another boy in a park in Longton on Saturday, 24 November. ‘We wanted to re-assure you that we are actively carrying out enquiries in relation to this and have already arrested a teenage boy from Preston on suspicion of a public order offence. We will let you know as soon as there are any further updates. This follows footage revealed earlier this week of a syrian refugee being ‘waterboarded’. Video of 15-year-old Jamal being attacked went viral and has led to a huge backlash against the bully himself. 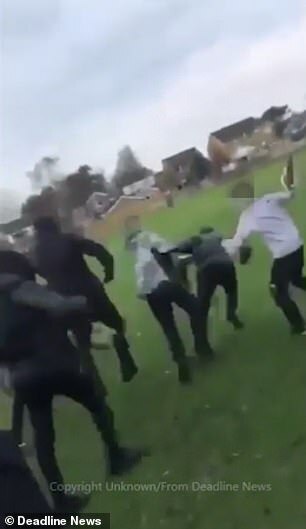 More footage also shows how cops were attacked by a gang of 100 teenagers where they were attacked with fireworks and bricks.